I was born in a small town at the border of Poland and Czech Republic. My introduction to metal came through a few friends at school back in 1982. I begun by listening to AC/DC, Black Sabbath, Iron Maiden and Accept. By mid-80s I discovered Celtic Frost, Destruction, Sepultura and Death. There was no turning back. Second wave of death metal followed with Cannibal Corpse and Morbid Angel, soon after that I got introduced and fell in love with the sick sounds of Carcass and Napalm Death. In the early 90s I started a grindcore band called Eulogy. My love for metal continued throughout the 90s with the likes of Fear Factory, Arch Enemy, Suffocation and countless more. In ’94 I formed Multichaos, a band I am the only member of. In late 90s I got seriously interested in Swedish Gothenburg movement with In Flames and At the Gates at the top of my list. As the new millennium approached my musical horizons broadened by including progressive metal and some symphonic metal as well. 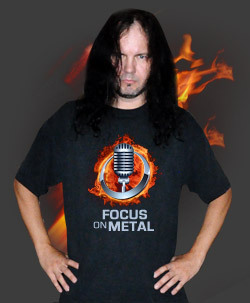 In 2006 I created an internet podcast called Radioactive Metal which is still going strong. In the early 2010 I left Radioactive Metal to concentrate on new Multichaos album as well as bringing Focus on Metal to life. I am a dedicated metalhead who is interested in extreme forms of metal that rely on technical abilities as well as metal that has a very organic feel and execution. I’m as much of a fan of Brain Drill or Necrophagist as I am of Dream Theater or Porcupine Tree. I’m a huge fan of instrumental music especially Satriani, Gilbert, Friedman or Petrucci. I’m not interested in a lot of metalcore or modern, overproduced and synthetic sounding metal. I am always open to hearing new and exciting bands, if you think there is something I should hear, let me know, be assured that I Focus on Metal.